Give your lips the love they deserve! Colour Quench lip tints packs major moisture, nourishing naturals and gorgeous, sheer colour into one perfectly portable, 100% recyclable tube. Essential fatty acids from rich and amazing avocado and coconut oils leave lips luscious and healthy. Natural flavour and 5 perfect shades produce the prettiest, most kissable mouth ever. Moisturizing EFA`s with avocado and coconut oils. Spot-on sheer colour; subtle, natural flavour. 100% recyclable tube. 100% vegan. Cruelty-free. Free of phthalates, parabens, mineral oils, GMOs, triclosan, propylene glycol and petroleum. Cocos nucifera (coconut) oil, euphorbia cerifera (candelilla) wax, theobroma cacao (cocoa) seed butter, persea gratissima (avocado) oil, aroma (natural fragrance with essential oils), tocopherol (vitamin E), rosmarinus officinalis (rosemary) leaf extract. 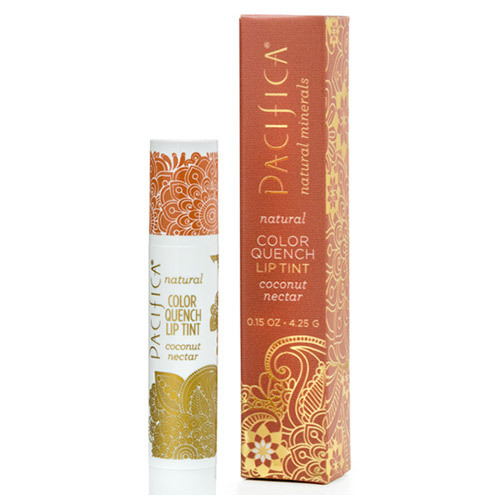 Below are reviews of Pacifica CQ Lip Tint Coconut Nectar - 4.25g by bodykind customers. If you have tried this product we'd love to hear what you think so please leave a review. Give your lips the love they deserve! Colour Quench lip tints packs major moisture, nourishing naturals and gorgeous, sheer colour into one perfectly portable, 100% recyclable tube.